Very nice and clean small hotel. Alicia, the owner was very nice and helpful and breakfast was excellent. Good location. 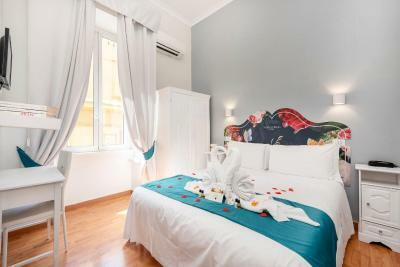 Great budget hotel in a really convenient location - a few minutes' walk from mazoni metro station, 15 min walk from termini and several bus lines near it as well. Breakfast is consistent and the directions for a late check-in couldn't have been clearer. The staff was amazing and very accommodating (answered questions, helped me print out tickets, etc.). Just a friendly place to stay if you know what you're paying for. Affordable, great staff, cozy and nice place, and fairly convenient. 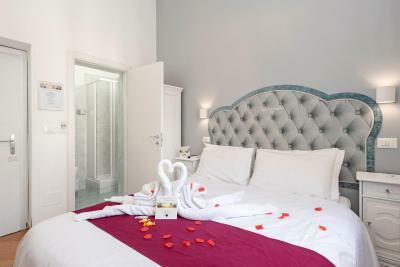 You wont go wrong with Hotel Infinito. Overall, our stay was pleasant. 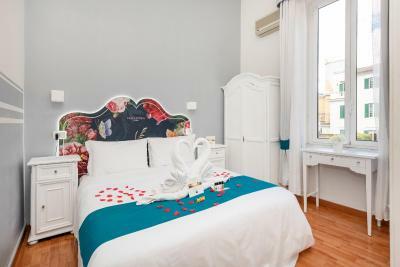 The staff were friendly, the room was clean and topped up with extra shower gel/shampoo when required, and the bed was comfortable. This was the worst hotel I had ever been. Photos do not match reality at all. 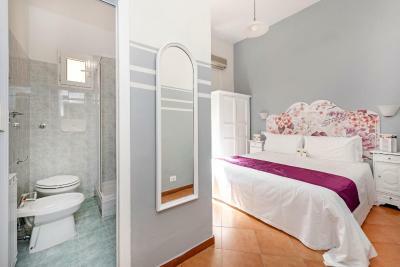 Single rooms could be as small as 10 square meters and the bathroom maybe half a square meter It was hard to shower. In my opinion, this is a 2-star hotel and does not have the value of a 3-star hotel. Hotel is reasonable for the price you! Unfortunately for me, Brazilian real is very weak now, so I couldn’t afford much. 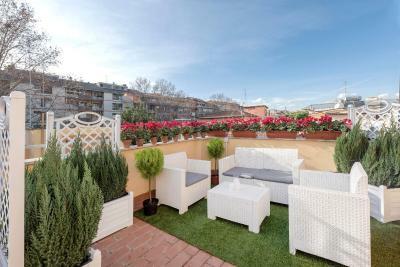 Close to Metro Manzoni, walk distance (25/30min) to crowded areas like coloseo and others near by. Elegant building. Pretty room. Great breakfast and staff. 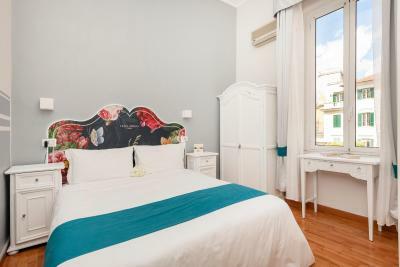 Hotel Infinito This rating is a reflection of how the property compares to the industry standard when it comes to price, facilities and services available. It's based on a self-evaluation by the property. Use this rating to help choose your stay! One of our best sellers in Rome! 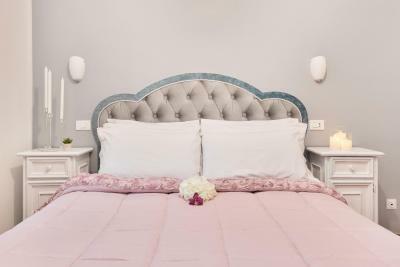 Set 1,650 feet from Rome’s Manzoni Metro Station, Hotel Infinito offers classic-style rooms with a flat-screen TV and free WiFi throughout. 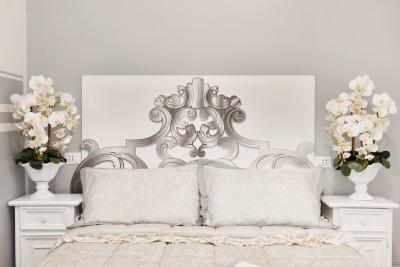 Porta Maggiore is 5 minutes’ walk away. 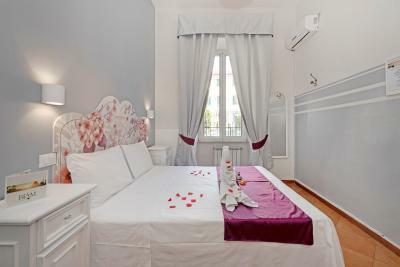 All air conditioned, rooms at the Hotel Infinito include satellite channels, a desk and a telephone. The private bathroom has free toiletries and a hairdryer. Some rooms come with parquet floors. A buffet breakfast with organic and gluten-free options is available. At the hotel an outdoor playground area is also available. 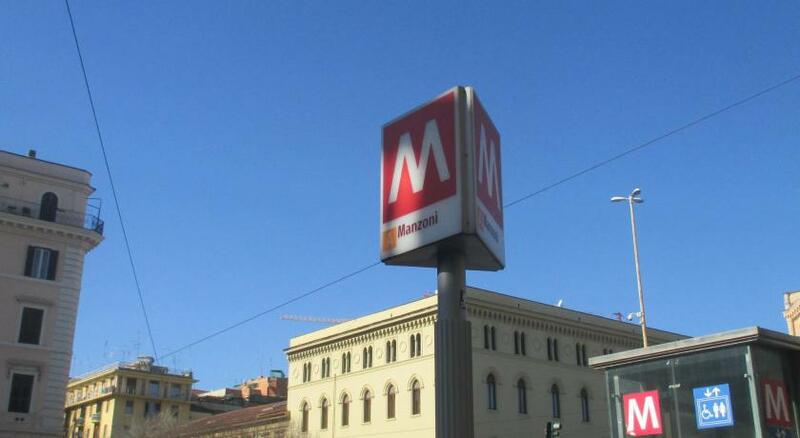 Termini Station is 2 metro stops from the hotel, which is a 20-minute walk from the Coliseum. 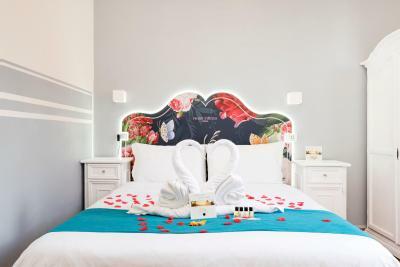 When would you like to stay at Hotel Infinito? 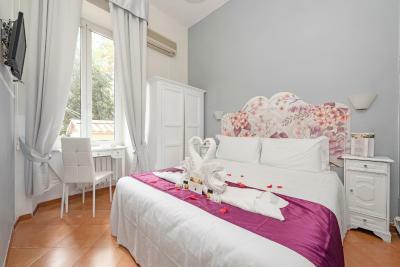 Featuring parquet floors and free WiFi, this room includes air conditioning, a safe and 32" satellite LCD TV. It comes with a private bathroom with free toiletries and a hairdryer. Includes access to the shared terrace. 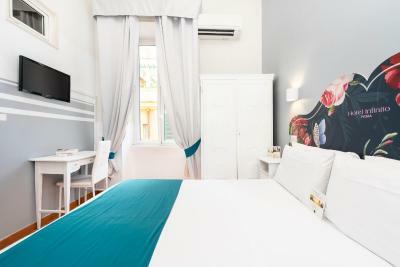 This small room features free WiFi, air conditioning and a 32" satellite LCD TV with satellite channels. It comes with a private bathroom with free toiletries and a hairdryer. This economy room features a classic décor. It comes with air conditioning, free WiFi and a 32" satellite LCD TV. The private bathroom comes with free toiletries and a hairdryer. Includes access to the shared terrace. This air-conditioned room includes exclusive access to a rooftop terrace accessible via a staircase. The terrace cannot be accessed after 23:00. It includes air conditioning, free WiFi and a 32" LCD TV with satellite channels. The bathroom includes a hairdryer and free toiletries. 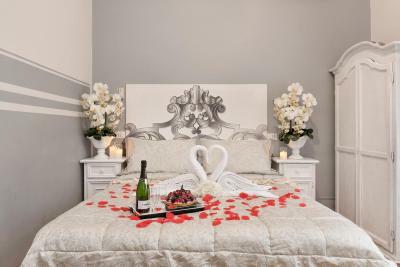 House Rules Hotel Infinito takes special requests – add in the next step! ATM card Hotel Infinito accepts these cards and reserves the right to temporarily hold an amount prior to arrival. Hotel Infinito accepts these cards and reserves the right to temporarily hold an amount prior to arrival. Please inform Hotel Infinito of your expected arrival time in advance. You can use the Special Requests box when booking, or contact the property directly using the contact details in your confirmation. It said on the website that the railway station is close by, it wasn’t, couldn’t take the metro in the morning because the first left at 5.30am 20 min from our station and I would have missed my airport train, so I had to take an expensive taxi. The station is about 30 min walk away. Very friendly stuff,small,but stylish room.Breakfast is super and varied. 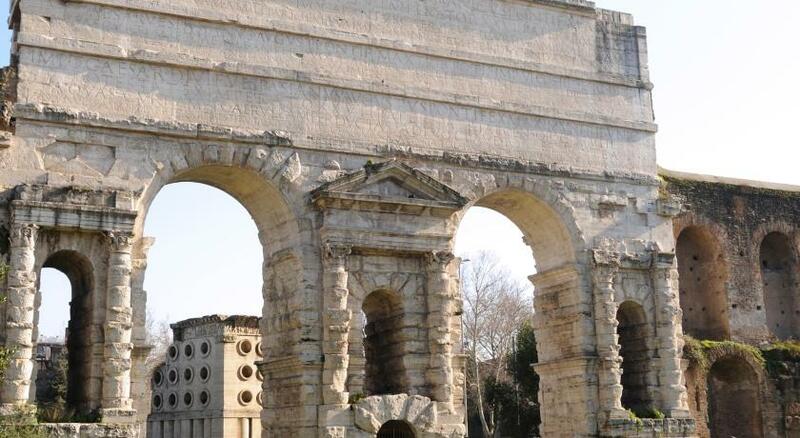 Location is near old town(Colosseum, Forum Romanum is 20min.walk). 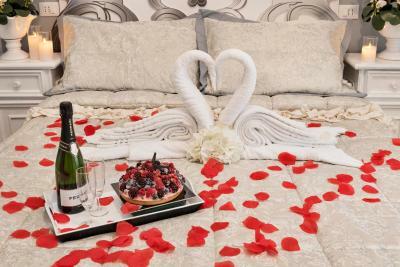 We were also very pleased with my birthday present, which the hotel prepared for us when we were out. Thank you for a very plesant stay. Very good and clean hotel and the staff was exelent and helpful. the shower is super small. 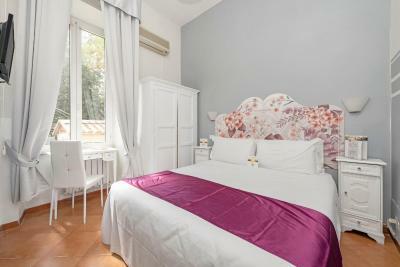 Location was really good, close to Manzoni Metro station. Terrace on the top of the building is also nice. Staff was friendly and helpful. Room was pretty small but bed was comfortable. On the last afternoon a bottle of champagne was waiting for us in the room as a nice and unexpected present from the hotel management. Thanks for that. The doors to the bathroom and shower should be improved. I know that in the budget room the space is limited,but this doors aren't meant for the restroom,especially not for the shower,all the water is coming out. Also in the shower would be great to have some kind of holder to your shampoo and amenities. I feel that breakfast could have been a little better. The only day fruit was there was our checkout morning. However, what I did eat was lovely. The pastry selection was really good along with the jams for toast. I would suggest fruit being available every day and not just apples and bananas. Perhaps oranges, grapes, melon as well. And also a proper toaster. I like my toast in the morning and only a sandwich toaster was available. The bread was really thin so only really warmed the bread and made it a little crusty. Having said that, it was still nice to eat. My partner was able to eat very well so it is just the little things. This is the second time we have stayed at the hotel and like last time, our stay was perfect. The staff are all very friendly. Our room was clean and although it's a small double, it was just right for what we needed. The location of the hotel is also perfect. Just a short walk from a supermarket and Metro station and about a 15 minute walk (depending on your own walking speed) from the beautiful Colesseum. On our last evening, we came back to the room with a lovely surprise of a box of chocolates and a thank you note. Such a nice little touch. The room was quite small. The breakfast mainly consists of sweets, but there was also some cheese,boiled eggs, tomatoes and bread. I think more can be offered. Also the breakfast starts at 7:30 in the morning which from my point of view is a bit late. We had to leave at 7:45 in some days to get in time to some reservations and we barely had time to east something really fast. The stuff was very kind. The location is close to a Metro station, only 5 minutes walk. Very good sweets at the breakfast. Some neighbours were very noisy. First night a lady spent an hour on her phone between midnight and 1am and was so loud, we couldn’t sleep. We raised the issue next morning and we didn’t hear that lady again. Second night, two gentlemen came in to their neighbouring room around 2am and kept talking between themselves for about an hour. We couldn’t sleep until they stopped. Raised the issue with the hotel staff in the morning and didn’t hear those guys again. Friendly & helpful staff, good location, clean room and essential facilities.